One of the reasons geocaching is more fun than waymarking is that the greater user base has caused people to create all sorts of neat statistical tools that generate fun maps and whatnot. I've been generating maps lately with mygeocachingprofile.com. I've been sharing them via screenshots, such as the one below. The alternative is to include HTML code, which I've done at the end of the post. The problem with HTML code, in my opinion, is that if I am sharing, "Look how I've filled in this map," and then I fill in even more of the map next month, the HTML code will update the map to reflect something that won't match what I'm saying. The HTML code is good if you have a page where you want to share, "Here's the latest info," but less if you want to tell a story. 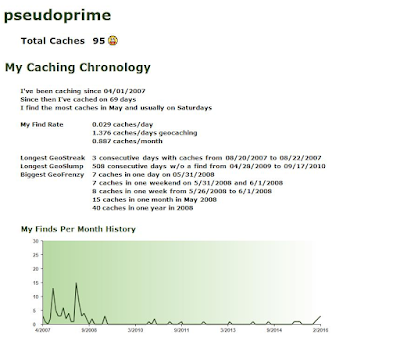 My story now is that I'm at 95 caches. While My Geocaching Profile checks various challenges, it does not check the longitude and latitude ones. I'm one step closer, though, as I found a cache in 76° 42', bringing me to 17 of 60 minutes for the 76 West challenge. One other thing you can do on My Geocaching Profile is compare the average difficulty and terrain ratings of your finds with others who have uploaded their data to that site. I am at 8698 out of 8704. 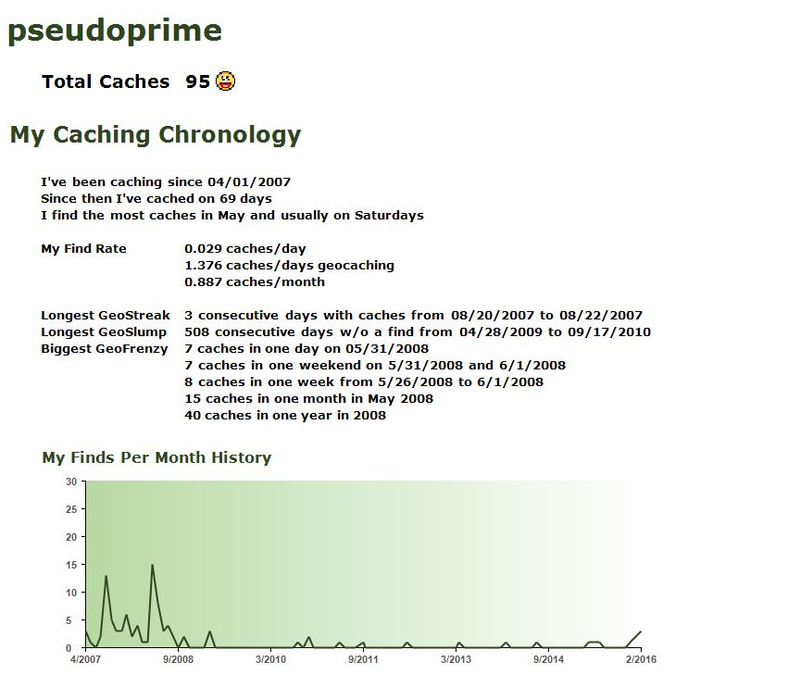 That means I seek out caches that are less challenging than 99.93% of the site's users. I'm strangely proud of that.